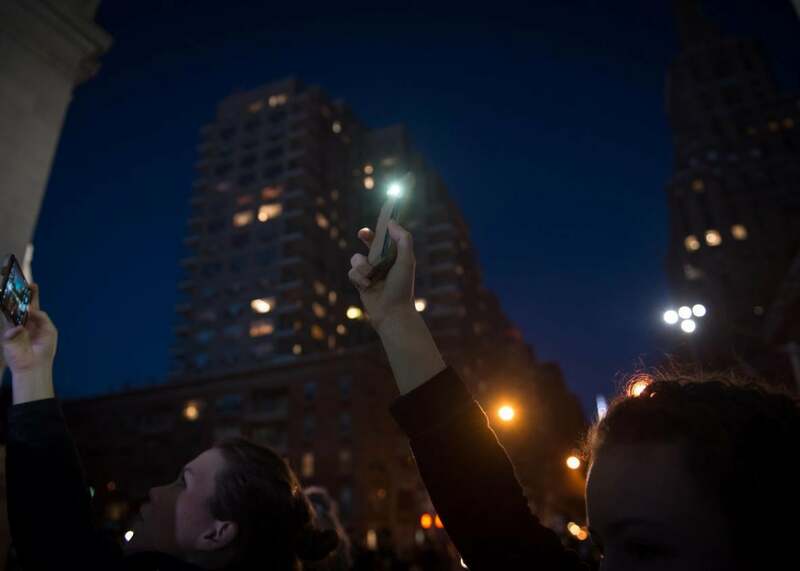 People hold up cellphones at a New York protest on Wednesday. A flurry of activism including airport protests and the recent Women’s March on Washington have left many participants feeling energized and more confident than ever in the power of people. But where do we go now? What are the next steps for the would-be soldiers of activism? I’ve studied the opportunities for individual people to serve as vigilantes to leverage technology across the globe, including in developing democracies as part of Harvard Kennedy School’s Transparency Policy Project. I have also examined the promising civic innovations happening across localities in the United States to regain civic voice and civic power. Below are four tech-supported strategies that you can use with your friends, neighbors, and colleagues. It will also be critical to engage with existing community institutions as well as state and local government. The tools I mention here can help you connect and organize, but they won’t do all of the work for you. 1. Truth advocacy: We need to hold power to account by bringing new and relevant facts into the public light, whether it’s undisclosed tax information or facts about where public officials receive their financing from. Digital platforms can help amplify facts and, in turn, put pressure on public officials. Take, for example, Mumbai Votes, a project in India that uses crowdsourced information from students and activists. Mumbai Votes puts out a scorecard for elected officials, tracking their political behavior and their ties to big business, and helping shed light on whether people are maintaining their campaign promises. Or Fair Play Alliance in Slovakia, which increases citizens’ ability to obtain, process, and understand information about politicians and politics in the hopes that this will increase voter accountability, force politicians to follow the desires of their constituencies, and encourage better all around governance. Domestically, there are many tools that citizens can leverage for advocacy, including text-based FrontlineSMS, which is being deployed in several parts of the United States. An easily accessible way to engage is to look at the Sunlight Foundation’s website and identity key domestic issues you feel passionately about. 2. Social monitoring: In addition to advocating for specific causes, community residents can also monitor governance on the ground. People can serve as citizen watchdogs in their communities by spotting public problems and bringing them to light, often through use of mobile phones. For example, people are reporting nonemergency public problems from potholes to rodents to public officials by using apps like SeeClickFix and engaging with open government data to track progress. But this approach isn’t just about quality-of-life problems. For instance, people in Kenya turned to Ushahidi, which means “testimony” in Swahili, to monitor election violence after Kenya’s disputed 2007 presidential election. Checking out Ushahidi’s website is a good first place to start. 3. Mobilization: Many of us who marched or organized recently may have been inspired to protest by our friends posting on Twitter or Instagram. Throughout the past years, we have witnessed the ability digital tools serve as important catalysts to strengthen ties between people. From the Arab Spring to MoveOn, social media, text messages, and online platforms can help people organize and mobilize around key issues. For instance, CoWorker.org is an online platform for non-unionized workers across the country to come together online around specific campaigns. They have organized around a host of worker issues, including better labor practices for Starbucks baristas. But mobilization isn’t only about online tools—it can mean postcard writing campaigns or knocking on doors around a specific cause. Start by hosting a potluck dinner bringing together different parts of your networks, discuss key topics you are passionate about, and even have everyone call or email their elected officials before dessert. 4. Participatory democracy: Finally, being an activist requires working with elected officials to make our communities more inclusive, responsive, and representative. A new set of democratic innovations can let people become more direct decision makers. Take, for example, participatory budgeting, which gives people the power to make budget decisions over a direct portion of public monies. Neighborhood residents identify local funding priorities, work directly with public officials to draft viable budget proposals, and then send the proposals back over to community residents for a vote. If passed, the proposals are implemented by elected officials. More than half of the New York City Council is implementing participatory budgeting, and the process is allowing traditionally marginalized communities to have a say in politics. Check out the website of the Participatory Budgeting Project to see if the process is happening in your community, and if not, call your local elected officials and ask them why they are not. There is no quick fix for democracy. Each of these strategies requires people to take action and work together in new and, sometimes, difficult ways. But the good news is, there are increasingly accessible pathways and opportunities for action. We just need the will to do it. As Tim O’Reilly wrote in 2010, “Those of us who spend our time on the Internet celebrate Wikipedia, but most of us have forgotten how to do crowdsourcing in the physical world.” Now we have to start blending the online and offline work to be active participants in our democracy.